The *NEW* Permitting and Fees Online Payment Portal allows customers to pay for Tarentum Borough permitting (building, fence, electrical, plumbing) and various fees (occupancy permits, shut off fees, utility security deposits). Please click on the portal to make a payment. More details and information are provided below. If you have questions about the online payment system, please contact Michele Williams in the payment office. *NEW* Payments by Phone: 1-855-285-9062. An IVR (interactive voice response) surcharge fee of $1.00 is charged in addition to the online fees listed below. Look for the card below in your next utility bill! Cards also available at the front desk of the payment office. *NEW* Online Payment Portal at: www.invoicecloud.com/tarentumboropa. Fee for EFT/ACH payment is $1.50. Fee for MasterCard, Visa, Discover is $3.50 with a maximum of $350 per transaction. You can make multiple transactions if your bill is over $350. We also participate with the LIHEAP Program which can help Electric portion and runs November-April. 5% penalty added after due date of bill, plus 1% penalty at end of month outstanding balance. $10.00 charge added for Delinquent Notice send on the 5th of the month for prior month unpaid balance. If utilities are terminated for non-payment, the entire bill plus a $25.00 reconnection fee is required to reinstate your electric. MUST BE PAID BY CASH, MONEY ORDER, CREDIT CARD, NO CHECKS WILL BE ACCEPTED. If this is not done 10 days after electric service is terminated, water service will also be terminated and your bill will be finaled out. To have services turned back on you will be required to pay bill in full and pay a $50.00 reconnection fee for both utilities. You will also be required to place a security deposit prior to re-starting services. Click on “Forgotten Password?” at the bottom of the login screen. You will need your account number and email address to retrieve your password. If you’re unable to locate this information, you may call us at 724-224-1818, and after verifying your identity, we can assist. You can pay current utility bill, misc. permits, parking tickets, & NSF checks online. There is a non-refundable service fee of $1.50 per transaction when using electronic check and $3.50 per transaction when using a credit/debit card. The service fee will be shown on the payment page before you submit your payment for processing. If paying by phone there is an additional $1.00 IVR surcharge. Yes, simply login to your account and select “View my payment history”. Simply log into your account and change any of your personal information under the My Profile tab. If you are unable to change some of your information, you may need to contact us to make the change. AutoPay is a convenient option in which bills will be paid automatically each billing cycle on the due date using your default credit card or bank account. This will avoid any late fees and free you from having to remember when to pay. Login to your account and click on AutoPay to enroll. Yes, simply login to your account and click on AutoPay. Next, select Edit and change the status to “No, I do not want AutoPay” and save. 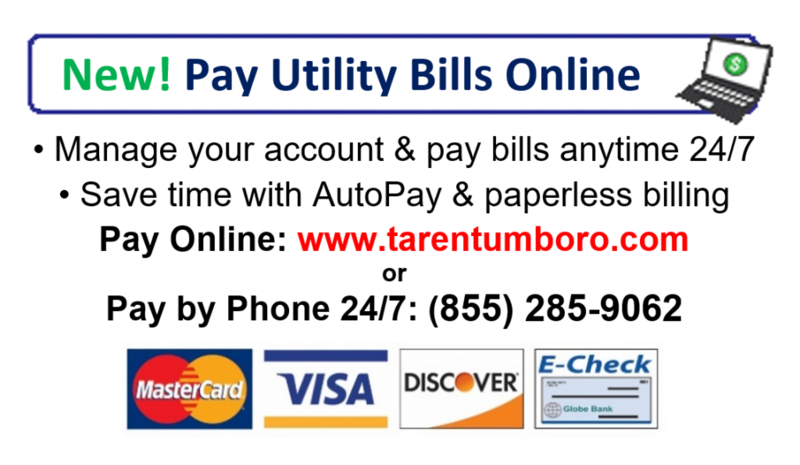 AutoPay is an automated process which pays your balance in full each billing cycle. Scheduled payments are manually entered by you for the date you choose. You will want to contact your bank and cancel your automated bank draft before the payment is due and then you can choose to enroll in AutoPay using a credit/debit card or bank account through our online payment portal. Account Linking means that payers can link multiple accounts and view and pay all open bills in a single transaction. When registering bills under the same email address, payers are given the option to link the related accounts within the service. What is Pay by Text? Pay by Text is a convenient way to pay your bill by text message. When signed up for Pay by Text, bill notifications will be sent by text message (this is in addition to email notifications) and you will then have the option to pay by text message with your default payment method with a quick reply. You may sign up for Pay by Text when making an online payment or by accessing your account and selecting the Pay by Text option. A confirmation text will be sent to complete enrollment. Please contact us at 724-224-1818 and we will do our best to assist you. If you are registered, you can log in to the online payment portal to view your bill. Or, you can call and ask us to resend the email. Absolutely. Invoice Cloud will safely store your financial information using Payment Card Industry (PCI) Compliant systems. This includes truncating (abbreviating) account numbers so that even the biller does not see your complete account information.